YES! I made an account and successfully logged on! Now can I begin playing? NO! Of course not! You don’t even know how! But that’s what I’m here for ^_~. As you can see, I have pointed out some crucial things about this game map; let’s have a look, shall we? – a link to the imprint, which will give you same basic info on the company and its creators. Button 2: As the text says, in this section, you can find the link list, which you can use in case you purchase Travian PLUS. Button 3: This is the taskmaster; he gives you tasks you need to complete as he guides you into the basic principles and concepts of the game. By clicking on him, you can check if there are any new tasks for you to complete, or if there is a reward waiting for you for already completing a task. Button 4: Infobox is a signpost with newest information about your account as well as the Travian world. For example information about release of Artefacts can be found here, but also information about expiration of your gold bonuses or any gold promotion currently running. Button 5: This is the alliance shortcut. There’s a short summary of your alliance. Button 6: This is your hero; yes, this too is a button! Clicking on the avatar of your Hero will take you to the hero options page, where you can equip your hero, change his resource production, alter his appearance, and so on. You can also find information about Hero’s health, number of available adventures, Hero’s experience and link to auction. Also, current Hero’s home is displayed here. Button 7a: This is the village overview button. It takes you straight to the page you are already on. Button 7b: This takes you to your village centre, which is where you can build many buildings, like a rally point, cranny, or even an academy. Button 7c: This is the map button, which will bring you to the huge world map of Travian. If you click it, it will show you exactly where you are located, but lets worry about that later. Button 7d: This is the statistics button. It will take you to something like a ranking system for the game. You can see where you stand against other players. 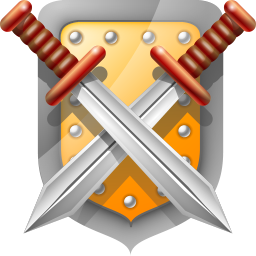 Button 7e: This is the reports button; you receive reports when you complete a trade, receive reinforcements, are attacked or have completed an attack, and so on. The button will glow green when there is a new report for you to see, and a number of new unread reports will also be shown. Button 7f: This is the messages button; by clicking on this button, you will be taken to your inbox. There, you can read your received and sent messages, or write new ones. Just like the reports, when there are new messages for you to read, the button will glow (gold) and a small number will be displayed, telling you how many unread new messages you have. Button 8: Here is the information about your current warehouse status displayed. 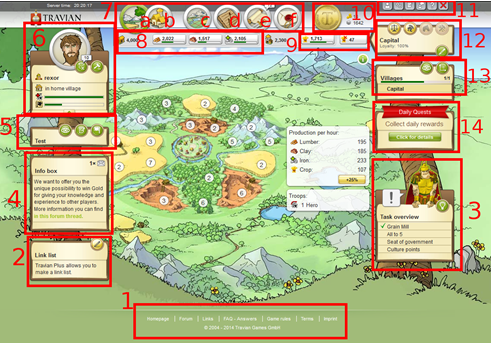 In case there’s a gold bonus production running, a small green button is displayed. When clicked, you can see a summary about the production. Button 9: This part displays the crop production and crop balance information. Button 10: This is the Plus/Gold button. It shows you how much Gold (and Silver) you currently have; when you click on it, you will be taken straight to the page where you can purchase Gold and activate Plus account and Gold club features. Silver balance is shown here as well. Button 11: This part contains several buttons: your profile button (by clicking on it you can change your profile), your preferences button (by clicking on it, you can change the settings of your account, add sitters, or even set your account to deletion), a forum button (by clicking on it you can open the offial .com forum), a chat button (by clicking on it you can join the IRC chat), a help button (by clicking on it a page with information concerning the help system opens), and last but not least the logout button. Button 12: The signpost shows you the current loyalty level of the selected village. In case you have activated Travian PLUS quick links to Marketplace, Barracks, Stables and Workshop are available above the village name if they exist in the village. Button 14: This button leads you to Daily Quests. Now that we have talked about the buttons, you will know exactly what all the interface buttons that will appear on every page do, but you still need to learn a little more about the game itself before you can become a true Travian player. Don’t fret; you are well on your way to becoming one of the most powerful rulers in the game.